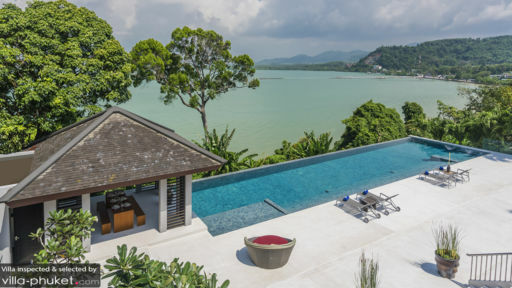 Cape Yamu is a private peninsula in Phuket, Thailand surrounded by Phang Nga Bay home to vivacious marine life and comprising several luxury resorts and villas. Bian Maprao is one such holiday villa with five bedrooms and a mission to afford a luxurious and memorable stay to its guests. Traditional Thai design merges seamlessly with modern aesthetics to give you an experience unlike any other as you will see reclaimed teakwood, earthy tones, and whitewashed walls in an elegant display. The villa is fully staffed to ensure all your needs and requirements are met with the greatest care! 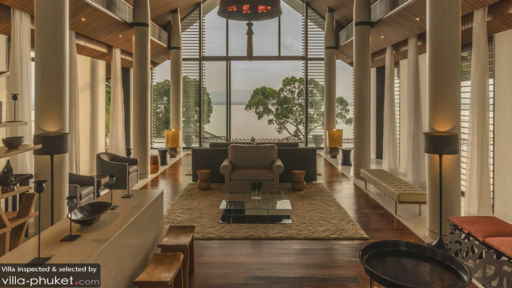 Baan Maprao is equipped with five, equally comfortable bedrooms with en-suite bathrooms. The master bedroom is located on the ground floor overlooking the pool and beyond that the sea. It is furnished with a queen-sized bed featuring quality linen, minimal and elegant decor, a flat-screen TV, and dressing area. The en-suite bathroom features a deep soaking bathtub, dual basins, and a walk-in shower. The four bedrooms are found on the ground and first floor of the villa also with en-suite bathrooms. Each bedroom is furnished with queen-sized bed and offers a stunning view of the scenic beauty of the island. There are 47-inch televisions in the rooms for your entertainment as well. En-suite bathrooms are fully-equipped with necessary amenities including rain showers. 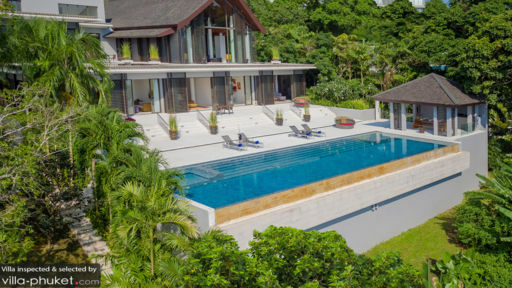 Surrounded by lush greenery and forestry in an effort to present a naturally abundant and bounteous ambiance, Bian Maprao features a 22-metre infinity swimming pool, overlooking the bay, and a gorgeous view of the tropical vegetation. There are sun chairs or loungers where guests can laze and sunbathe under the tropical sun, or simple relax with a good book. A stunning poolside dining pavilion is housed in a sala with soft, yellow lighting to cast an enchanting glow once the sun sets. Bask in the glorious view as you dig into your hearty meal prepare especially for you! A gorgeous living area is open-sided, leaving an opening from where you can enjoy the beautiful view of the water and the beach. From the comfortable sofas, hardwood flooring, exotic chandelier, and elegant decor, it is safe to say that the living area is an opulent space furnished with a designer’s flair to create a common ground where everyone can come together for a relaxing evening. A high-soaring roof with spotlights adds that extra bit of charm to the living area giving it a luxurious and homely vibe. You will find an indoor dining area directly accessible from the pool as well, furnished with a six-seater dining table for guests. The dining area is furnished with great care as well with selective artwork on the walls, armchairs, natural lighting, and a spacious layout. The villa also features a media and entertainment room with a 70-inch flat-screen TV mounted on the wall along with plush L-shaped sofas, and black-out curtains so you can enjoy impromptu movie nights. The villa is fully-staffed with a villa manager overseeing the work of house chef, groundskeeper, 24-hour security, and attendants. For additional services such as babysitters or drivers, arrangements can be made, however, these come at an extra charge. You can even request the chef to prepare scrumptious meals for you and your guests! Guests of the villa have the privilege of making use of the five-star spa and sport facilities at nearby Point Yamu by COMO for an additional fee. The location of Cape Yamu allows you to explore the limestone karsts of Phang Nga Bay, or the Khao Phra Thaeo National Park, and even the Bang Pae Waterfall!